OXYGUARD ® combines the economy of a galvanic cell with a highly efficient electrolyte for a virtually maintenance-free monitor with a sensor life of more than five years under normal conditions. 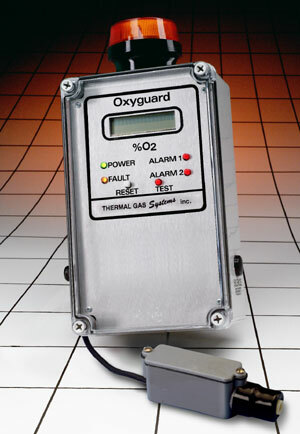 With OXYGUARD ®,there is no influence from CO 2 ,CO,H 2 S, NO X ,SO 2 or H 2 .The monitor operates in normal ambient temperatures with a very stable output signal. Simply install OXYGUARD ® and it is ready to go to work. Warm-up time and field recalibration are minimal. When you require continuous oxygen monitoring for refrigeration equipment, machinery rooms, medical imaging systems, oxygen incubators or food storage rooms,you can depend on the OXYGUARD ® for effective, economical operation. Remote sensor with 6 ft.instrument cable and DIN plug, extendable to 200 ft.
Sensor element is unconditionally guaranteed for three years from the date of shipment. Any sensors found defective in that period will be replaced free of charge. Read terms and conditions of sale for complete warranty information.